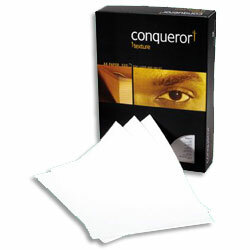 In today’s business world, Conqueror papers cut through the blizzard of business communications to make your message stand out. Conqueror Texture Laid - Conqueror with the ever-popular Laid finish. Eye catching tactile paper ensures your communications stand out. 5 - 49 reams - £16.69 per ream. 50 + reams - £15.99 per ream.